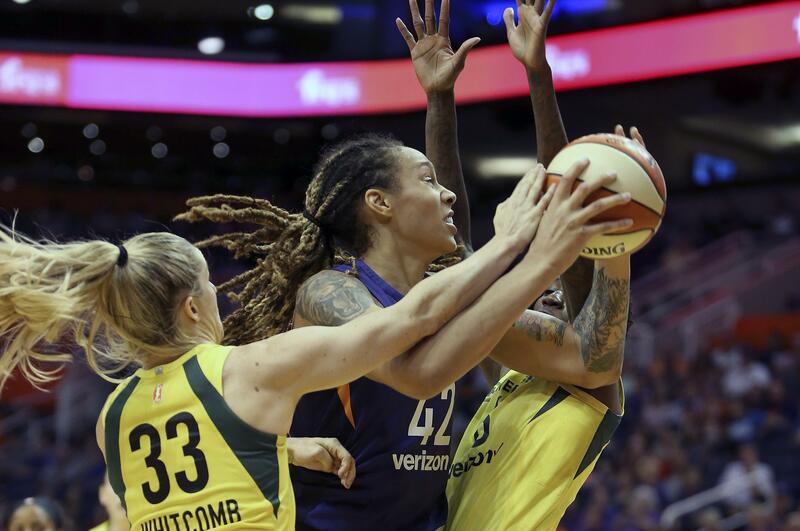 PHOENIX – Brittney Griner scored with 14.1 seconds to play then prevented Breanna Stewart from getting a shot off before the buzzer as the Phoenix Mercury rallied from a 17-point deficit to beat the Seattle Storm 86-84 on Sunday and force a deciding Game 5 of their WNBA semifinal series. Stewart, the WNBA’s MVP, led Seattle with 22 points. Griner’s winning basket came after Bonner missed and Phoenix’s Camille Little grabbed the rebound. Little got the ball to Griner, who scored. The Storm worked the ball to Stewart at the end but she couldn’t get a shot off against the 6-foot-8 Griner’s defense. Phoenix trailed by 17 in the first half, 16 early in the second and still was down 69-57 after Stewart sank a 19-footer with 1:27 left in the third quarter. But the Mercury responded with a 13-2 run. Taurasi sank a 3 with 3.6 seconds left to cut the lead to 71-66 entering the fourth quarter and Bonner’s basket sliced the deficit to 71-70 with 8:40 to play. Griner’s basket tied it at 76-76 and Bonner’s two free throws put Phoenix up 78-76 with 5:29 to play, the Mercury’s first lead since the game’s opening moments. Seattle had rolled to a 31-16 lead after one quarter, the Storm’s highest-scoring quarter in their postseason history. Published: Sept. 2, 2018, 4:42 p.m.